7-Day Weekend: STUDENTS VERSUS PRISONERS? “Choosing universities over prisons: this is a historic realignment of California’s priorities.” On January 6th, Governor Schwarzenegger asked the state legislature to reduce the amount of money it spends on prisons, so it can redirect those funds to colleges and universities. As he noted in his speech, the state’s priorities have gotten horribly “out of whack” over the years: 30 years ago, 10 percent of the budget went to higher education and only 3 percent to prisons; today, higher education gets 7.5 percent, while prisons get 11 percent of general funds. What made the governor finally take note of this? In an interview after the speech, the governor’s chief of staff Susan Kennedy admitted that “those protests on the UC campuses were the tipping point.” By protests, she did not mean the teach-ins and die-ins. She meant the wave of occupations and other mass disruptions (including the storming of the Chancellor’s house in Berkeley), which—beginning on November 17th—brought riot police to UC campuses. It was these actions, and these actions alone, that finally forced the governor to reflect on the state’s “unhealthy” priorities. Nevertheless, the governor’s response will only make matters worse. 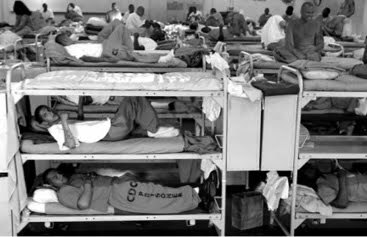 The California prison-system houses 170,000 inmates in 33 prisons and 12 correctional facilities. It was built to hold half that number. In August, a panel of three federal judges ordered the state of California to release 43,000 inmates due to the low level of medical care and other conditions creating an “immediate [risk of] death and harm.” The governor, of course, refused. The system is clearly over-burdened and under-funded, so how did the governor propose to reduce costs? He said that no prisoners would be released early, even though most of them are in prison for non-violent drug-related crimes. Instead, he proposed cost-cutting measures similar to those implemented at the university: downward pressure on staff salaries, further reductions in inmate medical-costs, and the construction of private, for-profit prisons to relieve crowding. This “solution” is dangerous for our movement. If we continue to disrupt campus activities, the state will be forced to respond, but if—in our demands—we pretend that this crisis is a crisis of the university only, we risk getting what we need at the expense of other, less privileged members of society. Indeed, as the governor made clear in his speech, the state will not solve its problems by raising taxes. What government would raise taxes in the middle of a protracted crisis? Instead, the state will continue to cut social spending: on parks, on health care for the poor, on prisoners, on state employees and on students. We cannot allow ourselves to be pitted against one another. But what possibilities exist for solidarity between us? In the 1960s, black people rioted against the commodification of ghetto life, while white and black workers rebelled against being reduced to cogs in the factories. Students occupied university campuses and formed councils, while inmates took over prisons to demand better conditions. These fractions failed to merge. How will we?